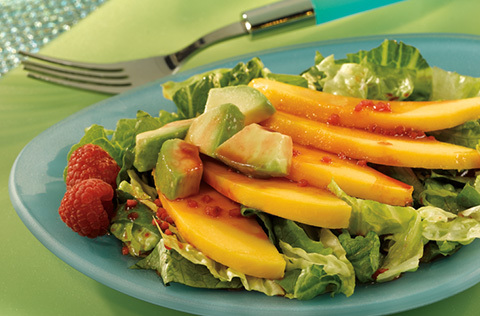 This fresh and nutritious salad of chopped greens, sliced avocado and mango is drizzled with a vibrant dressing made with V8 V-Fusion Açai Mixed Berry, olive oil, balsamic vinegar, garlic, Dijon-style mustard and pepper. Beat the juice, oil, vinegar, water, mustard, garlic and black pepper in a medium bowl with a whisk or a fork. Divide the lettuce among 4 salad bowls. Top with the mango and avocado slices. Spoon 2 tablespoons of the vinaigrette over each salad. Serve immediately. Tip: Garnish with fresh raspberries.